An iPOD Gets This Ol' Cowboy to Dancin'! I never ever even thought of ever buyin' an iPOD! I see those kids on TV Dancin' an' jigglin all over with the things, and it never occured to me that they might be of any use to me. What's a puss gut Ol' buster gonna do with one?! 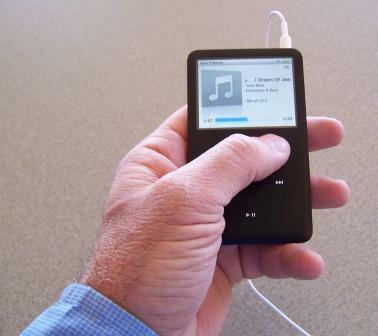 This iPOD of mine has turned out to be one of the sweetest Christmas Presents the Missus has ever bought me! 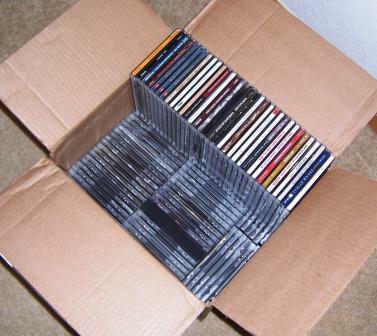 I expect that quite a few folks have lots bigger CD music collections than I do. At 111 CD's, I suppose it ain't huge... but it sure seemed like it was to me! Fact is, there were quite a few CD's I'd not listened to in a few years, 'cause it was such a hassle to dig out the disc, and swap it out in the truck stereo. So... more often than not... we ended up listening to the same discs for weeks... I told you before... I lean hard toward lazy! And, in the Fifth Wheel, where storage space is at a premium... where am I gonna put the cases? Not now! Of my collection, I've gotten 103 CD Albums loaded onto my laptop and then 'synchronized' with my Apple MP3 player. 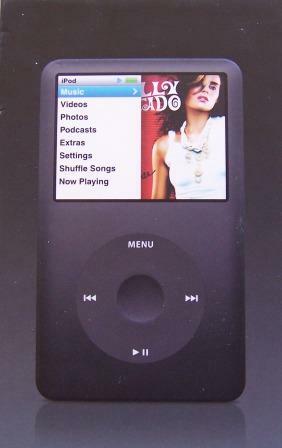 The Boss Lady picked me out a model, the iPOD Classic, that has an 80 GB capacity... Geez! That's a lot! ... and They have one that has 160 GB! I suppose there are other MP3 machines that are cheaper... but I'd guess the one built by Apple is the Grandaddy of 'em all! Of that 80 GB... I've only filled up 6.35 GB! with 1392 songs that'll play for 3.2 days of continuous music... without ever playin' the same tune twice! With only 8 CD's left to load... that leaves a huge space for NEW music! and no worry about where I'm going to store the disc... or how I'm going to access the music on the road... Just push a button, and that lil', smaller-than-a-deck-of-cards iPOD pulls up whatever music I want to hear and sings it out through them lil' ear bud gizmos! Sweet! Holy Mergatroid! How much music would that 160 giga biter hold?!! It can't help but get my feet to dancin'! .... just like them kids on the TV!... Wierd! And... it keeps on gettin' better! You don't want to drive down the road with them iPOD ear buds stuck in your ears... you'll not be able to hear emergency vehicles and such. Easy! There are several outfits that make another lil' gizmo you plug into your dash power. You can do it with a plug in cradle set up... or you can use a wire... and then lay the gizmo with your iPOD plugged in, anywhere in the cab that toots your whistle. What you have to do is tune the FM tuner on your radio to an unused channel... then tune this little gizmo to the same channel... turn it on and it transmits the music from your iPOD via FM signal to your RV Stereo system! Your own lil' Stereo FM Radio Station! Powered by Apple! Don't know about Mac computers .... but Apple has hit a home run with their iPOD! Just took me a decade or so to find out!... not just lazy... sometimes I'm a slow learner. The little FM transmitter gizmo we're using with my Apple built MP3 player came from a company called Griffin Technology Inc. 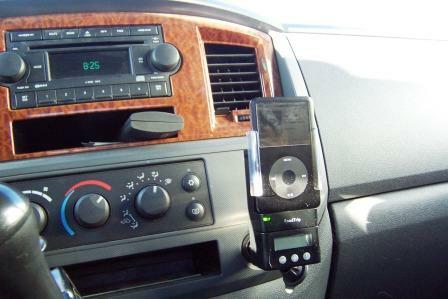 It's called the 'RoadTrip' Charger and FM transmitter for iPOD. 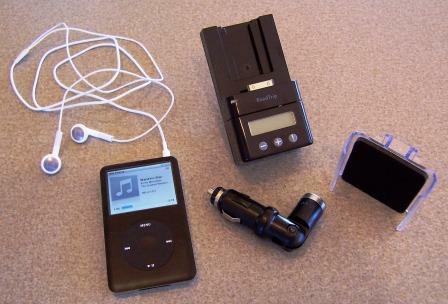 There are several other companies building the same kind of an iPOD accessory... so you've got plenty to choose from. The thing will work both in the fiver... transmitting to the stereo radio there... or in the cab!Sweet! Now... that box of CD music discs comes out of the Fifth Wheel and goes into our storage area... and I have a huge opportunity to go out and collect far more music than I already have! Oh Yeah! With no concern for worryin' over where I'm going to store it! Fact is... with the Itunes system you can buy a song, or an entire album and download it right off the internet... no CD Case to store anywhere! How sweet is that!